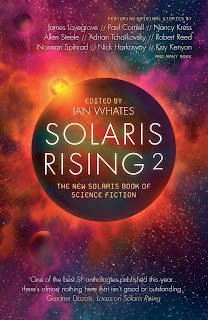 In less than a week, Solaris Rising 2 will launch at Waterstones Gower Street in London where editor Ian Whates will be joined by authors Paul Cornell, James Lovegrove, David Mercurio Rivera, and Martin Sketchley, to talk about their contributions to this cosmic collection. Solaris Rising 2 is available for pre-order on Amazon.com, Amazon.co.uk and indiebound, and is jam-packed with SF short stories that explore man's efforts to leave this humble dot of blue in a sea of black, and all this week on the Solaris blog, the collection's authors are talking about the short story form and their favourite examples of it from SF. "People ask me all the time what my favorite books are or my favorite short stories. I try not to give conflicting answers, even though I know I do. Because my favorites change depending on what I've just read or on the weather outside. Or maybe it’s just my faulty memory, unable to call up the right book at that precise moment. "So when Ian Whates asked me to write about my favorite SF story I had trouble remembering what I had said before to other websites and in other interviews. I’m too lazy to Google myself (besides, that sounds rude), so I had to recast the question. "What’s the most influential sf story I've ever read—influential on my own writing that is. 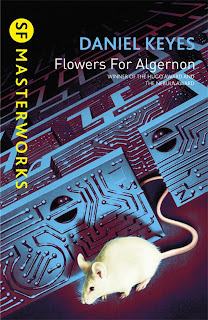 And that’s easy: Flowers For Algernon by Daniel Keyes. "In the 1970s, my older sister taught English at a very poor high school in Texas. She found that if she assigned the students a genre book, the students would read willingly. But they wouldn't take the books from the classroom unless they could hide the books in their back pockets. Slim mass-market paperbacks—the original pocket books—were the best. "She sent me a bunch of those books one summer. I’m not sure if she did so because she was including me or because she was clearing out her office or if she just wanted to give me a nice gift. But in that stack, which included all kinds of wonderful things, was Flowers For Algernon in the movie tie-in edition, with Cliff Robertson on the cover. I still have it somewhere. "I remember it vividly because I read it in one sitting and cried so hard I almost hurt myself. I vowed then and there to never see the movie because it would just be too painful to watch. I still haven’t seen the movie. I've reread that story dozens of times. I should say that I've read the novella and the novel dozens of times. Sometimes I prefer the long version; sometimes I prefer the shorter version. It really doesn't matter which. Both versions showed me how science was personal, that the best science fiction was human science fiction. "Years later, my sister was asked to teach a science fiction literature course at the college where she worked as an English professor. She called me, annoyed. They had assigned her the class because of me. They figured we both knew SF, loving it equally. She then informed me she had never read science fiction and didn't understand it and how could she teach it? "I walked over to my bookshelf and looked at all the sf books she had given me over the years. To a title, they were all humanistic SF, without almost no technical jargon at all. On that call, I simply listed all the SF books she had given me. “Start there,” I said.